Alberto Contador Velasco (Spanish pronunciation: [alˈβeɾto kontaˈðoɾ βeˈlasko]; born 6 December 1982) is a Spanish former professional cyclist. He is one of the most successful riders of his era, winning the Tour de France twice (2007, 2009), the Giro d'Italia twice (2008, 2015), and the Vuelta a España three times (2008, 2012, 2014). He is one of only seven riders to have won all three Grand Tours of cycling. He has also won the Velo d'Or a record 4 times. He was regarded as the natural successor of Lance Armstrong and won the 2007 Tour de France with the Discovery Channel team. During his time at the Astana team, he won the 2008 Giro d'Italia, the 2008 Vuelta a España and the 2009 Tour de France. Between 2007 and 2011 he won six consecutive Grand Tours that he entered. This included winning the 2010 Tour de France with Astana, although it later emerged that he had tested positive for clenbuterol during the race. After a long battle in court, he was suspended by the Court of Arbitration for Sport and stripped of his 2010 Tour and 2011 Giro wins. Contador was born on 6 December 1982 in Pinto in the Community of Madrid, the third of four children. He has an older brother and sister and a younger brother, who has cerebral palsy. Having previously taken part in other sports, such as football and athletics, Contador discovered cycling at the age of 14 thanks to his elder brother Francisco Javier. When Contador was 15, he began to compete in races at the amateur level in Spain, joining the Real Velo Club Portillo from Madrid. Although he got no victories that year or the next, he demonstrated great qualities and was soon nicknamed Pantani (after Marco Pantani, regarded as one of the best climbers of all time) for his climbing skills. In 2000, he experienced his first victories, winning several mountains classification prizes from prominent events on the Spanish amateur cycling calendar. He dropped out of school at the age of 16 without having finished his Bachillerato and signed with Iberdrola-Loinaz, a youth team run by Manolo Saiz, manager of the professional ONCE cycling team. In 2001, he won the under-23 Spanish time trial championship. Contador lives with his wife Macarena in the city of Pinto when not competing. He has a fascination for birds, keeping personally bred canaries and goldfinches at home. Contador turned professional in 2003 for ONCE–Eroski. In his first year as a professional he won the eighth stage of the Tour de Pologne, an individual time trial. He deliberately let himself fall back on the morning's road stage and saved energy to deliver the winning effort in the time trial in the afternoon. During the first stage of the 2004 Vuelta a Asturias he started to feel unwell, and after 40 kilometers he fell and went into convulsions. He had been suffering from headaches for several days beforehand and was diagnosed with a cerebral cavernoma, a congenital vascular disorder, for which he underwent risky surgery and a recovery to get back on his bike. As a result of the surgery, he has a scar that runs from one ear to the other over the top of his head. Contador started to train again at the end of November 2004 and eight months after the surgery he won the fifth stage of the 2005 Tour Down Under racing for Liberty Seguros, as the team previously known as ONCE had become. He subsequently described this win as the greatest of his career. He went on to win the third stage and the overall classification of the Setmana Catalana de Ciclisme, thus winning his first stage race as a professional. He also won an individual time trial during the Tour of the Basque Country, where he finished third, and the fourth stage of the Tour de Romandie, where he finished fourth overall. In 2006, he won stages at the Tour de Romandie and Tour de Suisse in preparation for the Tour de France. Prior to the start of the race he was implicated along with several teammates in the Operación Puerto doping case by the Spanish authorities, and the team was not able to start. He was later cleared by the Union Cycliste Internationale, cycling's governing body. Contador returned to racing in the Vuelta a Burgos but he crashed after finishing fifth in stage 4, when he was riding back down to the team bus, and briefly lost consciousness. 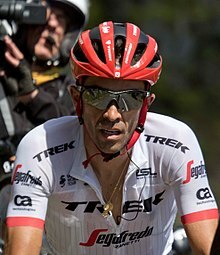 After having been implicated in the Operación Puerto doping case, Contador was without a professional contract until mid-January 2007, when he signed with Discovery Channel. Contador's first major professional victory came with the 2007 Paris–Nice, which he won on the race's final stage. Discovery effectively wore down the remnants of the race leader Davide Rebellin's Gerolsteiner team, allowing Contador to launch an attack on the final climb. With Rebellin leading the chase, Contador held off his competitors in the final kilometers, winning him the race. In the 2007 Tour de France, he won a stage at the mountaintop finish of Plateau-de-Beille, and was second in the general classification to Michael Rasmussen. Upon Rasmussen's removal from the race before stage 17 for lying to his team about his pre-race training whereabouts, Contador assumed the overall lead and the yellow jersey, though he did not don it until after the stage. In the stage 19 individual time trial, he managed to defy expectations and keep hold of the yellow jersey by a margin of only 23 seconds over challenger Cadel Evans and 31 seconds over teammate Levi Leipheimer. As this was the Tour's penultimate stage, it was the last real competition of the race (since the final stage is traditionally non-competitive save for a bunched sprint to the finish line) and it secured Contador his first Tour de France victory. It is the closest the top three finishers in the Tour de France have ever finished to one another. After Discovery Channel announced 2007 would be its final season in professional cycling, Contador announced on 23 October 2007 that he would move to the Astana team for 2008. On 13 February 2008, the organizer of the Tour de France, the Amaury Sport Organisation, announced that Astana would not be invited to any of their events in 2008 due to the doping previously perpetrated by Astana, despite the fact that its management and most of its ridership had changed before the 2008 season. Consequently, Contador was unable to defend his 2007 Paris–Nice and 2007 Tour de France victories. He went on to win his second Vuelta a Castilla y León, as well as the Tour of the Basque Country by winning the opening stage and the final individual time trial. His next scheduled race and objective was the Dauphiné Libéré but his team received an invite to the 2008 Giro d'Italia one week prior to the start of the race. Contador was on a beach in Spain when he was told he was going to ride the Giro. Despite the lack of preparation, he finished second in the first individual time trial and took the pink jersey after the 15th stage up to Passo Fedaia. Upon winning the final pink jersey in Milan, he became the first non-Italian to win the Giro d'Italia since Pavel Tonkov in 1996 and also the second Spanish rider to win the Giro after Miguel Indurain won in 1992 and 1993. He later emphasized the importance of this win by saying that "taking part in the Giro and winning it was a really big achievement, bigger than if I'd had a second victory in the Tour de France". At the 2008 Summer Olympics, Contador competed in the road race and the individual road time trial. He did not finish in the road race, in which 53 of the 143 starters did not complete the course in particularly hot and humid conditions. He placed fourth in the individual time trial, eight seconds behind his regular teammate Leipheimer. Contador entered the 2008 Vuelta a España as the main candidate to win. His biggest challenger was likely to be compatriot Carlos Sastre, who had won the Tour de France just a month before. Contador won stage 13 by attacking on the fabled Angliru climb and this resulted in him capturing the golden jersey as the leader of the race. He extended his lead by winning stage 14 to Fuentes de Invierno and maintained his lead in subsequent flat stages and the final time trial. That final time trial was won by Leipheimer by a wide margin. Contador later took some offense to Leipheimer seemingly riding with winning the Vuelta in mind, after it had been established earlier in the race that Contador was Astana's team leader. In the final standings, Contador finished 46 seconds ahead of Leipheimer and more than four minutes ahead of Sastre. The win made him the fifth cyclist to win all three Grand Tours, after Jacques Anquetil, Felice Gimondi, Eddy Merckx, and Bernard Hinault. In the process he also became the first Spaniard, youngest (age 25), and shortest amount of time to accumulate all three wins (15 months). He also became only the third cyclist to win the Giro and the Vuelta in the same year, joining Merckx (who did it in 1973) and Giovanni Battaglin (who did it in 1981). Later in the year, Contador won the Vélo d'Or award for the best rider of the year for the second consecutive season. The Giro and Vuelta winner beat Olympic time-trial champion Fabian Cancellara and Tour winner Carlos Sastre in a vote by international cycling writers. 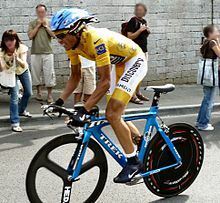 On 9 September 2008, Lance Armstrong announced that he was returning to professional cycling with the express goal of participating in the 2009 Tour de France. Astana manager Johan Bruyneel, Armstrong's former mentor and sporting director, said that he could not allow Armstrong riding for another team and later signed him. The announcement by Armstrong clashed with the ambitions of Contador, who insisted he deserved the leadership of Astana, and hinted at the possibility of leaving the team if he was given a secondary role supporting Armstrong. Contador was later given assurances by Bruyneel that he would remain team leader and decided to remain at Astana for the 2009 season. Contador later claimed the situation was drastically overblown by the media. Contador decided to miss the 2009 Giro d'Italia to focus on winning the Tour de France. Contador started his 2009 season at the Volta ao Algarve race in Portugal, winning the overall classification, placing second on stage 3, and winning the decisive 33 km individual time trial. He was in position to win Paris–Nice again after winning the prologue and the toughest mountain stage, but suffered a breakdown in stage 7, losing his yellow jersey to fellow Spaniard Luis Leon Sánchez. Contador and his Astana team later blamed the breakdown on Contador eating inadequately, leaving him without the energy to chase attacks. Contador finished fourth overall. Contador continued his build up to the Tour by racing the Dauphiné Libéré. He put in a strong performance of the opening time trial and stayed in touch with race leader Cadel Evans on the longer time trial. However, the strong ride of compatriot Alejandro Valverde up the Ventoux distanced Contador and he rode to help Valverde take the Yellow Jersey while finishing comfortably in third place overall. Contador won Stage 15 of the 2009 Tour de France by soloing to the finish line more than a minute ahead of most of his closest GC competitors, and in so doing took the general classification leader's yellow jersey. He then extended his lead on Stage 17, after finishing second in a breakaway of three riders with the same time as the stage winner, and then the next day he won the second time trial, increasing his overall advantage to more than four minutes. Contador won his second Tour de France on 26 July 2009 with a winning margin of 4'11" over Andy Schleck. He finished 5'24" ahead of Lance Armstrong, who finished third in his return to the Tour after a four-year absence. Contador had won the last four Grand Tour races that he had entered. During the celebration at the podium, the organizers of the Tour wrongly played the Danish National Anthem instead of the Spanish Royal March. In the aftermath of the tour, Contador and Armstrong engaged in a war of words, with Contador quoted as saying that, although Armstrong "is a great rider and [..] did a great Tour[, but] on a personal level [..] I have never admired him and never will", and Armstrong responding that "a champion is also measured on how much he respects his teammates and opponents." The sniping caused others, such as the director of the Tour, to wonder "what it would have been like to have had Contador and Armstrong in different teams." Contador later described the experience as "psychologically tough", likening it to having to compete in two races – one on the road, the other in the team hotel. Armstrong's control of the team during the race extended to its entire fleet of team cars, forcing Contador to rely on his brother to take him from stage finishes to the hotel. On 31 July, Contador's agent (who is also his brother) announced that Contador had turned down an offer to remain with Astana under a new four-year contract because he had felt so uncomfortable being caught between the Kazakhstan owners of the team on one side and Bruyneel on the other, and he was hoping to leave Astana at the end of the year, although his contract did not expire until the end of 2010. However, on 11 August, Contador's teammate and close friend Sérgio Paulinho accepted a two-year contract with Team RadioShack, indicating that Contador might not be able to leave Astana as readily as he and his agent wished. This was confirmed on 15 August, when a spokesperson for the Kazakhstan sponsors of Astana said that they intended to sponsor the Astana team on the UCI ProTour through 2013 and that they intended to enforce the last year of Contador's contract with Astana in 2010. On 21 February, Contador won his first race of the season, the Volta ao Algarve, by winning its queen stage and finishing second in the final time trial. Due to new UCI regulations concerning the nose cone of time trial bikes, Contador did not use his Shiv time trial bike, and instead used the standard red Specialized time trial bike. On 14 March, Contador won his second Paris–Nice, finishing ahead of other pre-race favorites like Alejandro Valverde and Luis León Sánchez. His main attack came in the mountaintop finish to Mende, where he crossed the finish line alone and successfully secured the yellow jersey. Contador also competed in and concluded the Criterium International with a second place in the final time trial, only 2 seconds behind stage winner David Millar, while Pierrick Fédrigo successfully defended the maillot jaune against rivals such as Cadel Evans and Samuel Sánchez..
Contador was a favorite coming into the 2010 Tour de France, along with Team Saxo Bank's Andy Schleck. On Stage 15 Schleck was race leader and pressing the pace over the day's final climb of Port de Bales when he threw his chain. Contador and Denis Menchov immediately moved to the front and attacked, pressing the advantage over the crest of the climb and all the way back down into Bagneres-de-Luchon. They were aided by Sammy Sanchez and two others making a group of five riders. Schleck chased hard, but had no other riders to help bridge the gap. By stage's end, he had lost the yellow Jersey and 39 seconds to Contador. Contador, who now had an eight-second lead in the race, met with a mixed reception as he received the yellow jersey on the podium at the end of the stage. It is an unusual occurrence in the Tour for the new race leader to be met with whistles and cat calls as he is given the yellow jersey. The yellow jersey changing shoulders made a large difference in the remainder of the race, for now the onus was on Schleck to attack Contador, and not the other way around. Jered Gruber, writing for Velo Nation, argued that Contador was right to attack, defending him on the basis that Schleck did not wait for Contador when he was delayed behind a crash on the cobblestones in stage 3 and lost 1' 13" to Schleck, a crash that cost Schleck the aid of his best ally in the tour, his brother Fränk Schleck. But of course that was early in the race and neither rider had the yellow jersey at the time. Race commentator Paul Sherwen thought the attack in poor form, whereas his co-commentor Phil Liggett thought not. Schleck said he considered Contador's actions to be unsporting. Hours after the conclusion of the stage, Contador voiced an apology for his behavior on his YouTube channel. Five days later in the stage 19 time trial, Contador beat Schleck again, taking 31 seconds from him. Contador went on to win the Tour de France for the third time with an advantage of 39 seconds over Andy Schleck, the exact amount of time he had taken from Schleck on Stage 15. Contador became the seventh rider to win a Tour de France (later disqualified) without winning a stage. Contador signed a two-year contract with Saxo Bank–SunGard for the 2011 season, to ride under team manager Bjarne Riis, who revealed that he would like Contador to try winning all three Grand Tours in one season, a feat never before accomplished. Contador's agent and brother Fran later countered the statement by saying it was "nothing but a dream". Within two weeks, three of Contador's Spanish teammates signed to make the same transfer: Jesús Hernández, Daniel Navarro and Benjamín Noval. Amidst the clenbuterol controversy, Contador earned his first win in the Vuelta a Murcia. He won the overall classification as well as two stage victories en route to his victory. Later in the month of March, Contador entered in the Volta a Catalunya, where he claimed a win on the third stage to Vallnord, maintaining his advantage until the end of the race. He also won the individual time trial of Vuelta a Castilla y León. Contador competed in the 2011 Giro d'Italia, his first time racing in the Giro since his victory in 2008. Contador won the ninth stage on Mount Etna, his first stage win at the Italian Grand Tour. He attacked midway through the climb, dropping his overall rivals and gaining almost a minute on them. That stage gave him the overall lead in the Giro, as well as the points classification. Contador extended his overall lead to 3 minutes over second place Vincenzo Nibali where he broke away with Jose Rujano on the Grossglockner. He solidified his lead through stage 14 up the Zoncolan and a very difficult stage 15 through the Dolomites taking his lead up the 4 minutes ahead of second place Scarponi. He also won the 12.7 km (7.9 mi) mountain time-trial to Nevegal. On 29 May, Contador went on to win the race for the second time finishing 6 minutes ahead of second place Michele Scarponi. In addition to winning the General classification, Contador also won the Points Classification and finished second in the Mountains classification. Despite the fact that he was scheduled to appear before the Court of Arbitration for Sport in early August, Contador announced in early June he would compete in the 2011 Tour de France. The CAS had planned to hear the case in early June but the dates were pushed back to early August. Contador aimed to become the first rider to win both the Giro d'Italia and the Tour de France in the same year since Marco Pantani accomplished the feat in 1998. In the opening stage Contador got slowed down by a crash and lost more than one minute. He lost additional time in the team time trial at Les Essarts but finished second in the fourth stage up to Mûr-de-Bretagne. Contador suffered four crashes in the opening nine days of the Tour, injuring his right knee before facing the Pyrenees mountain stages. He was dropped in the final kilometer in the stage to Luz Ardiden and finished two seconds behind Andy Schleck at the top of the Plateau de Beille. On the sixteenth stage to Gap, Contador attacked on the ascent of the Col de Manse, with Cadel Evans and Samuel Sánchez joining him in taking a time advantage over the other favorites in the general classification, including more than a minute over Andy Schleck. He was also aggressive in the next stage to Pinerolo but unable to win time to the other favorites besides Thomas Voeckler and Ivan Basso. In the stage to Col du Galibier he lost time to the other favorites after Andy Schleck launched a solo attack sixty kilometers from the finish and Contador was later unable to follow the pace set by Cadel Evans. 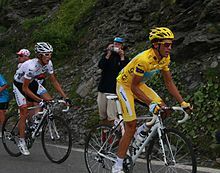 Contador launched an early attack on the last mountain stage to Alpe d'Huez, reaching the top of Galibier with Andy Schleck, but their effort proved unsuccessful and they were captured by the rest of the main contenders following the long descent from the mountain. Contador launched another attack on the first kilometers of Alpe d'Huez but he was eventually beaten to victory by Pierre Rolland with Samuel Sánchez second. Contador finished fifth in the overall classification, 3 minutes 57 seconds behind Cadel Evans, bringing an end to his streak of winning six consecutive Grand Tours that he entered. Contador started his season with still no verdict in the clenbuterol case. He finished second overall in the Tour de San Luis and he won both uphill finishes. He only fell short in the time trial stage of the race. On 6 February he was stripped of these early results, as well the 2010 Tour de France and 2011 Giro d'Italia wins and many other victories. He was also suspended until 5 August 2012 and his contract with Team Saxo Bank was annulled. On 8 June it was announced that Contador would rejoin Saxo Bank–Tinkoff Bank upon the completion of his ban, signing a contract that will keep him with the team until the end of the 2015 season. After the completion of his suspension, Contador competed in the 2012 Eneco Tour as preparation for the Vuelta a España where he finished 4th in the general classification. Consequently, Contador was named leader of Saxo Bank–Tinkoff Bank for the Vuelta a España. Contador attacked numerous times throughout the mountains in the first sixteen stages of the race, but with no avail, since the race leader Joaquim Rodríguez always countered and finished ahead of him. This proved costly since there were bonus seconds awarded to the first three riders of each stage: twelve seconds for first, eight seconds for second and four seconds for third. Even on the queen stage of the race, finishing atop the Cuitu Negru and featuring slopes with a gradient of more than 20% close to the line, Rodriguez annulled the numerous attacks of Contador and sailed past him to the finish. However, his fortunes turned around during the seventeenth stage; he attacked in that latter portion of the stage and made a solo effort up the final climb of the day after his breakaway companion Paolo Tiralongo of Astana was dropped. Contador won the stage by six seconds over the first chase group and took the lead away from Joaquim Rodríguez, who was relegated to more than two minutes in the general classification. He held on to the race lead during the last mountain stage leading atop the Bola del Mondo, where he was dropped by Rodriguez and Alejandro Valverde (Movistar Team), who held the second place overall. He managed to limit his losses and retain the lead of the race. On the next day, Contador crossed the finish line in Madrid with the race leader's red jersey, earned the second Vuelta victory of his career. Contador participated to the World Championships held in Valkenburg in both the road race and the individual time trial. He was ninth in the time trial, after being overtaken by eventual winner Tony Martin, who started two minutes behind him. For the road race, Contador rode in support of his Spaniard teammates and finished 53 seconds in arrears of the victor, Belgian Philippe Gilbert. Days later, Contador headed for Italy to take part in the newly resurrected Classic Milano–Torino. He took the win by accelerating on the final slope of the day in sight of the 'one kilometer' banner, dropping all contenders. It was the first time in his career that he won a single-day race, and he dedicated the event to the memory of Victor Cabedo, a young professional cyclist who died in a training accident a week prior. In 2013, Contador's only victory was a stage in the Tour de San Luis in January. From then on, his season did not go as expected: though finishing 3rd in the Tirreno–Adriatico he became ill during the race. This disrupted his preparations for the rest of the season. Contador returned to racing in the Tour of the Basque Country in April and finished fifth in the general classification. He was too late to be in optimal condition for the Tour de France, where he could not match up to Chris Froome and finished in fourth place. After the Tour, main sponsor Oleg Tinkov expressed critical comments on Contador's style of riding. At the end of the season, Tinkov bought the team ownership, but Contador stayed loyal to the team. After a disappointing 2013 season, Contador went into the season trying to find the form that allowed him to take numerous victories in the past. Contador's first objective of the season was the Volta ao Algarve. Although he would lose time to Michał Kwiatkowski after the Pole took two consecutive stage wins, Contador showed his much improving form in the race, taking third in the second stage and fourth in the third stage individual time trial before taking his first win of the season on the fourth stage. In the stage featuring a summit finish at Alto do Malhao, Contador attacked a kilometer from the finish as he eventually soloed to the stage win, three seconds ahead of Rui Costa. He would eventually finish second overall, 19 seconds down on Kwiatkowski. Contador's next race was the Tirreno-Adriatico where he faced a stiffer competition with riders such as Nairo Quintana and Jean-Christophe Péraud. He continued to show his strong form by winning the third stage of the race going to Cittareale after he outsprinted Quintana, his main rival for the race. He would take the lead in the general classification on the next day, winning a second successive stage as he attacked on the stage's penultimate climb before soloing to the finish. He would go on to keep his lead as he won the race in dominant fashion, finishing more than two minutes clear ahead of runner-up Quintana. Contador would race the Volta a Catalunya next, where he would have his first duel with riders such as Chris Froome and Joaquim Rodríguez. On the race's first mountain stage, he would follow attacks set by his fellow GC contenders before he had to settle for second in the stage, 5 seconds behind Rodríguez. He would finish the race in second place overall, just 4 seconds behind Rodríguez. Contador's next objective for the season was the Tour of the Basque Country. He would get into a duel with fellow Spaniard Alejandro Valverde and both riders did not disappoint on the first stage. Contador followed Valverde's attack on the stage's last climb before putting on an attack that Valverde was not able to answer. He would negotiate the descent and solo to the stage win and yellow jersey, 14 seconds ahead of Valverde. He would keep the race lead to the end, finishing second on the final stage time trial and winning the race by 49 seconds ahead of Michał Kwiatkowski. In the Tour de France, Contador entered the race in much better form. He would avoid crashing during the first week but he lost a lot of time in the fifth stage of the race, the stage featuring cobbles as part of the route. He lost around 2 and a half minutes to fellow GC contender, Nibali, as he was unable to bridge the gap to him after mud became stuck in his gears. On the Tour's first summit finish going to Gérardmer, he attacked as Nibali went with him. Contador made a final acceleration near the finish line as he took 3 seconds back on Nibali. However, disaster struck him on the 10th stage. On the descent of the Petit Ballon, Contador crashed heavily before he was treated on the side of the road. He tried to ride for nearly 20 kilometers after the crash but he eventually abandoned the Tour. He initially ruled himself out of the Vuelta as well but he eventually joined the start list of the race. His Vuelta would have a good start as his team, Tinkoff–Saxo, finished eight in the opening team time trial, 19 seconds behind the Movistar Team, the team which also fielded fellow GC contenders, Quintana and Valverde. On the race's first mountain stage to La Zubia, he was able to stay with the GC contenders as he eventually finished the stage in third place behind Froome and Valverde. He would show his improving form on the next mountain stage to Valdelinares, attacking with around two kilometers to go while dropping Froome and Valverde among others as he sat 3 seconds behind red jersey holder Quintana before the individual time trial. He would take the red jersey on the individual time trial as he finished fourth. He showed he could defend the red jersey by staying with his fellow GC contenders. On the race's queen stage to La Farrapona, he followed Froome's attack with 4 kilometers to go while distancing other GC contenders. He stayed in his rival's wheel before putting on a finishing kick with around 800 meters to go, winning the stage and strengthening his hold on the red jersey. The same thing happened on the penultimate stage to Puerto de Ancares where he followed Froome throughout the climb, distancing other GC contenders once again before kicking on to take the stage, all but securing the red jersey. On the final stage individual time trial, he rode conservatively on wet conditions to avoid any mishaps and though he lost time to the other favorites, he had more than enough time in hand to win his third Vuelta. During the Vuelta, Contador announced he would not contest the world championships in Ponferrada, saying the course does not fit his characteristics at all. Contador suffered a crash in the Il Lombardia, injuring the knee that was touched in the Tour de France and cancelling his chances of winning the UCI points classification, so he decided to forego the Tour of Beijing to better prepare for the 2015 season. For 2015, Contador announced that he would attempt to win both the Giro d'Italia and the Tour de France, a feat that had not been done since Marco Pantani accomplished it in 1998. His debut race was the Vuelta an Andalucía in February. He took the race lead after the time trial on stage 1b, finishing fourth. Contador then won stage 3, a mountaintop finish, by attacking with 7.5 kilometers to go. He did however lose the race leader's jersey on the very next stage, another mountain affair, where eternal rival Chris Froome snatched both the stage win and the race lead. Froome did not relinquish his lead and Contador finished the race second in the overall classification, only 2 seconds behind. In mid-March, Contador finished fifth Overall at Tirreno–Adriatico, helping his teammate Peter Sagan win Stage 6 by accelerating on a climb and shedding the pure sprinters off the leading group. At the end of the month of March, Contador took the fourth place Overall in the Volta a Catalunya, where he crashed severely in the penultimate stage. Contador was able to remount and participate to the last stage, securing his general classification placing. At the end of April, and days before the start of the Giro d'Italia, Contador revealed that he was ready for the Grand Tour race. His injuries sustained in the Volta a Catalunya were healed and included a micro-fissure in his sacrum. He stated: "I'm going very well, the big blocks of training here in the Canaries are all but finished and I'm now beginning to go through the recovery phase prior to the Giro. I've done a huge amount of climbing rides in these last three weeks and now what we've got to do is ease back before next week." At the Giro d'Italia, Contador's Tinkoff Saxo team performed well in the opening Team Time Trial, finishing 2nd to Orica Greenedge. He gained 6 seconds on Fabio Aru, 12 seconds on Rigoberto Uran, and 20 seconds on Richie Porte  Contador took the Maglia Rosa on the summit finish on stage 5 to Abetone. However, the next day, Contador dislocated his shoulder after crashing on the finishing straight. He was able to finish but dislocated the shoulder again before the podium presentation. Despite this, Contador was able to continue in the race held on to the Maglia Rosa. However, on stage 13, on what most would have assumed was an "easy day" of racing, Contador crashed in a pile-up, 3.2 kilometers from the finish. Because of this, Contador crossed the line 42 seconds behind the finishers as well as his main rival Fabio Aru, thus losing his pink jersey, the first time he lost the leader's jersey in any Grand Tour up to that point in his career. However the next day, on a 59.3 kilometer time trial, Contador led the field, taking back the pink jersey and created a sizable time difference over the rest of the peloton. On stage 16, Contador suffered a mechanical problem on the descent of Apria and other teams including Astana tried to take advantage. Still, Contador made contact with Aru at the Passo del Mortirolo and put another two minutes into his rival as Mikel Landa became the second-placed rider on the general classification. On Stage 20, Contador lost some time to both Landa and Aru but retained his pink jersey. Eventually, he won the overall classification by 1:53 minutes over Aru. Despite being stripped of his 2011 title for a doping suspension, Contador insisted that this was his third Giro victory, therefore including the 2011 race in his count. With his second official Giro championship to go along with two official Tour de France championships and three Vuelta a España championships, Contador joined Bernard Hinault as the only cyclists to have achieved multiple victories at each one of the three Grand Tours. In preparation for the Tour, Contador chose to ride the four-day Route du Sud, where he won the queen stage and the overall classification. His main rival was Nairo Quintana, a competitor he will have to contend with at the Tour de France. After the tour, Contador planned on racing the Clásica de San Sebastián but had to cancel due to sickness, ending his 2015 season. In March 2015, Contador signed a contract extension with his team, Tinkoff, but at the same time announced that 2016 would be his final season in professional cycling. He competed in his first race of the season at the Volta ao Algarve, finishing third overall and winning the final stage of the race. He went on to claim runner-up finishes in Paris–Nice, where he attacked race leader Geraint Thomas from 50 km out and again on the final climb of Col d'Èze before Thomas closed the gap on the final descent to the finish line, and the Volta a Catalunya, before taking the general classification and the stage six time trial at the Tour of the Basque Country, subsequently stating to the press that he would postpone his retirement for at least another year. Contador got off to a difficult start to the 2016 Tour de France, crashing in the opening stages and losing time to his rivals. He was in 20th place on the general classification with a deficit of 3 minutes 12 seconds to leader Chris Froome before the ninth stage, where after attempting to make the breakaway at the start of the day, he withdrew from the race, citing a fever which had developed overnight. In August 2016, Contador won the overall classification of the Vuelta a Burgos, beating both Ben Hermans and Sergio Pardilla by just one second. He went on to finish fourth at the 2016 Vuelta a España. 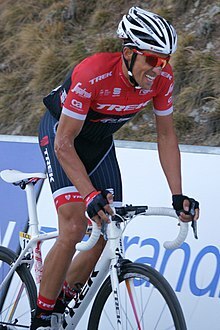 During the 2016 Tour de France it was reported that Contador would race for Trek–Segafredo for the 2017 season, with the deal being confirmed by the team in September, along with the transfer of teammate Jesús Hernández and Tinkoff directeur sportif Steven de Jongh. This would be his final season as a professional cyclist. In March, Contador missed out on victory in Paris–Nice to a Team Sky by a narrow margin for the second year running after Sergio Henao managed to fend off a final-day attack to win the race by just two seconds. Contador had trailed by 31 seconds overnight, but had gone clear with Quick-Step Floors rider David de la Cruz and Marc Soler of the Movistar Team; after taking a couple of seconds at an intermediate sprint, Contador was beaten to the line in Nice by de la Cruz, which cost him four bonus seconds and decided the race in favour of Henao. Later that month, Contador finished second overall at the 2017 Volta a Catalunya, 63 seconds behind Valverde. In April, Contador finished second overall at the Tour of the Basque Country, again behind Valverde. After final rosters had been presented for the 2006 Tour de France, Contador and five other members of the Astana-Würth team were barred from competing due to alleged connections with the Operación Puerto doping case. Contador and four other members of his team at the time, Astana–Würth, were eventually cleared of all charges on 26 July 2006 by the Spanish courts and later two out of the five (including Contador) were cleared by the UCI. Each received a written document signed by Manuel Sánchez Martín, secretary for the Spanish court, stating that "there are not any type of charges against them nor have there been adopted any type of legal action against them." In May 2006, a document from the summary of the investigation (Documento 31) was released. In it, the initials "A.C." were associated with a hand-written note saying, "Nada o igual a J.J." (Spanish for "Nothing or the same as J.J."). J.J. were the initials of Jörg Jaksche, who later admitted to being guilty of blood doping prepared by the Spanish doctor Eufemiano Fuentes in 2005. Contador was questioned in December 2006 by the magistrate in charge of the Puerto file. The rider declared to Judge Antonio Serrano that he did not know Eufemiano Fuentes personally. According to French daily Le Monde, he refused then to undergo a DNA test that would have judged whether or not he had any link to the blood bags that were found in the investigation. On 28 July 2007, Le Monde, citing what it claimed was an investigation file to which it had access, stated that Contador's name appeared in several documents found during Operación Puerto. A second reference includes initials of riders' names that appeared on another training document, although neither of those two references could be linked to doping practices. On 30 July 2007, German doping expert Werner Franke accused Contador of having taken drugs in the past and being prescribed a doping regimen by Fuentes, who was connected with Operación Puerto. He passed his allegations on to the German authorities on 31 July 2007. Contador denied the accusations, saying "I was in the wrong team at the wrong time and somehow my name got among the documents." On 10 August, Contador publicly declared himself to be a clean rider in face of suspicions about his alleged links to the Operación Puerto blood doping ring. In September 2010, Contador revealed that a urine sample he had given on 21 July, a rest day in the 2010 Tour de France, had contained traces of clenbuterol. He has stated, due to the number of other tests he passed and that only a tiny amount of the substance was detected in the one he failed, that food contamination was to blame. Adding credibility to the explanation, anti-doping doctor Don Catlin said that of the contaminants found in food supplements, clenbuterol is one of the more common. However, when asked if it was plausible that Contador had ingested the clenbuterol through contamination, Catlin said "without knowing what the level in his sample is, it's impossible to say." Contador stated that he is the victim, and he can "hold his head high" and that he thinks he should not be punished. Several people related to the sport defended Contador saying that there is little benefit from using the drug in the amounts that were discovered and that no one would intentionally take such an easily detectable substance. There has been some scepticism of Contador's claim that contaminated meat was to blame. In 2008 and 2009, only one animal sample came back positive for clenbuterol out of 83,203 animal samples tested by EU member nations. Out of 19,431 animal tests in Spain over the same period, there were no samples that came back positive for clenbuterol. Contador's urine sample, taken during the day before his clenbuterol positive sample, was reported to contain plastic residue (plasticizers) indicating possible blood doping as these materials are introduced to the bloodstream from blood bags used in blood doping, but the test is not recognised by the World Anti-Doping Agency, so no charges in relation to this finding were brought. A theory has circulated that blood doping could account for the minute traces if the clenbuterol was introduced through a transfusion, re-introducing contaminated blood that had been extracted at a time when he had been taking Clenbuterol. It was supposed that this caused the presence of it in his system and the subsequent failed test, rather than the direct ingestion or injection of the drug at the time. This theory also recognises that Clenbuterol is not very effective at all as a performance-enhancing drug, but it is effective if used to strip fat and hence reduce a rider's weight pre-season, and it is theorized that this is when the blood was taken which was later re-introduced by transfusion. The UCI issued a statement reporting that the concentration was 50 picograms per millilitre, and that this was 400 times below the minimum standards of detection capability required by WADA, and that further scientific investigation would be required. Contador was provisionally suspended from competition, although this had no short-term effect as he had already finished his racing programme for the 2010 season. Contador had been informed of the results over a month earlier, on 24 August. Later the amount discovered was clarified as 40 times below the minimum standards, rather than the 400 times originally reported by the UCI. Contador's scientific adviser claimed that he would have needed 180 times the amount detected to gain any benefit in his performance. In late January 2011, the Spanish Cycling Federation (RFEC) proposed a one-year ban, but it subsequently accepted Contador's appeal and cleared him of all charges. Contador returned to racing in February in the Volta ao Algarve, a race he won in 2009 and 2010. The UCI and the World Anti-Doping Agency each appealed the RFEC decision independently to the Court of Arbitration for Sport in March 2011, but Contador remained free to ride until the CAS made its ruling. The hearing with CAS was initially scheduled for June, but following an extension requested by Contador's legal team, it was rearranged for August, in the week following the 2011 Tour de France, and later postponed again until November 2011, with the result to be given in 2012. The decision on 6 February 2012 found Contador guilty of accidental ingestion of the prohibited substance Clenbuterol and hence he was stripped of his 2010 Tour de France title, and his results since that race, including victory in the 2011 Giro d'Italia and fifth place in the 2011 Tour de France, were voided, and he was suspended until August 2012. The following day, in a press conference, his contract with Team Saxo Bank was annulled. ^ a b "CAS sanctions Contador with two-year ban in clenbutorol case". Cycling News. Future Publishing Limited. 6 February 2012. Retrieved 6 February 2012. ^ "Alberto Contador found guilty of an anti-doping rule violation by the Court of Arbitration for Sport (CAS): suspension of two years" (PDF). The Court of Arbitration for Sport. 6 February 2012. Archived from the original (PDF) on 26 February 2012. Retrieved 13 February 2011. ^ a b c "Alberto Contador Biography". albertocontador.es. Archived from the original on 29 May 2009. Retrieved 18 May 2009. ^ "Talento y sacrificio para llegar a lo más alto" (in Spanish). El Diario. 10 August 2007. Retrieved 18 May 2009. ^ a b "Past Highlights & Podiums". Astana Team. Archived from the original on 31 July 2008. Retrieved 18 May 2009. ^ "Contador calm and confident ahead of CAS hearing". Cyclingnews. Future Publishing Limited. 5 November 2011. Retrieved 5 November 2011. ^ "Alberto Contador – Happy Just To Be Alive!". 23 October 2008. Archived from the original on 17 July 2009. Retrieved 22 May 2009. ^ "Spanish Fiestas:Alberto Contador". Spanish Fiestas. Retrieved 22 May 2009. ^ Fotheringham, Alasdair (18 April 2018). "Alberto Contador: The five races that changed my life". cyclingnews.com. Retrieved 18 April 2018. ^ Fotheringham, Alasdair (23 September 2008). "Tour of Spain winner Contador is world's top stage racer". Universal Sports via Reuters. Archived from the original on 13 February 2012. Retrieved 24 December 2011. ^ Speck, Ivan (29 July 2007). "Courageous Contador can lift the cloud". Daily Mail. UK. Retrieved 24 May 2009. ^ a b McRae, Donald (16 November 2015). "Alberto Contador: 'It would be perfect to win the Tour, do the Olympics and end'". theguardian.com. Retrieved 16 November 2015. ^ a b Clemitson, Suze (5 November 2015). "P Is For Peloton: The A-Z Of Cycling". theguardian.com. Retrieved 5 November 2015. ^ "Alberto Contador: Rider Profile". Cycling Weekly. 27 October 2008. Retrieved 18 May 2009. ^ a b Tan, Anthony (17 August 2006). "Former Liberty five: 2/5 cleared". Cyclingnews. Retrieved 18 May 2009. ^ Jones, Jeff (11 August 2006). "Contador crashes". Cyclingnews. Retrieved 18 May 2009. ^ Stokes, Shane (15 January 2007). "Contador signs with Discovery Channel". Cyclingnews. Retrieved 18 May 2009. ^ Quénet, Jean-François (18 February 2007). "Alberto Contador on Miguel Indurain's path". Cyclingnews. Retrieved 18 May 2009. ^ Brown, Gregor (22 July 2007). "Rasmussen takes control of the Tour". Cyclingnews. Retrieved 18 May 2009. ^ "The Rasmussen schandal". NRC Handelsblad. 6 January 2009. Archived from the original on 10 July 2009. Retrieved 20 May 2009. ^ Brown, Gregor (26 July 2007). "'Benna' blasts to first Tour stage win in Castelsarrasin". Cyclingnews. Retrieved 18 May 2009. ^ Brown, Gregor (28 July 2007). "Kid Contador conquers Tour de France". Cyclingnews. Retrieved 18 May 2009. ^ "Contador:Another Victory For Discovery". Letour.fr. 29 July 2007. Archived from the original on 8 June 2009. Retrieved 18 May 2009. ^ Hood, Andrew (23 October 2007). "Contador confirms with Astana". VeloNews. Archived from the original on 25 October 2007. Retrieved 23 October 2007. ^ Haake, Bjorn (13 February 2008). "Alberto Contador may not be able to defend Tour de France title". Cyclingnews. Retrieved 13 February 2008. ^ Hood, Andrew (9 May 2008). "Contador: from the beach to the Giro". VeloNews. Archived from the original on 24 July 2008. Retrieved 18 May 2009. ^ a b "Vuelta a España – Contador plays down favourite tag". uk.eurosport.yahoo.com. 29 August 2008. Archived from the original on 7 September 2008. Retrieved 21 September 2008. ^ "Cycling – Men's Road Race Final Results". The Official Website of the Beijing 2008 Olympic Games. 9 August 2008. Archived from the original on 24 December 2008. Retrieved 18 May 2009. ^ "Cycling – Men's Road Individual Time Trial Final Results". The Official Website of the Beijing 2008 Olympic Games. 9 August 2008. Archived from the original on 2 May 2009. Retrieved 18 May 2009. ^ ESPN.com news services (24 September 2008). "Contador says Armstrong could pose 'difficult' situation on team". ESPN. Retrieved 18 May 2009. ^ Brown, Gregor (21 September 2008). "Stage 21 – September 21: San Sebastián de los Reyes – Madrid, 102.2 km". Cyclingnews. Retrieved 21 September 2008. ^ Birnie, Lionel (21 September 2008). "Contador quickest to complete Grand Tour set". Cycling Weekly. Archived from the original on 24 October 2008. Retrieved 20 May 2009. ^ "Contador wins Spanish Vuelta; first Spaniard to win cycling's big three". Reuters via ESPN. 21 September 2008. Retrieved 20 May 2009. ^ Hood, Andrew (20 September 2008). "Leipheimer wins final TT; Contador locks up Vuelta". VeloNews. Archived from the original on 24 September 2008. Retrieved 20 May 2009. ^ "Contador maintains lead in Vuelta". AP via the Taipei Times. 22 September 2008. Retrieved 20 May 2009. ^ Farrand, Stephen (26 November 2008). "Contador Wins Velo d'Or Award". Cycling Weekly. Retrieved 18 May 2009. ^ "Lance Armstrong to return for 2009 Tour de France". Associated Press via the Arizona Republic. 8 September 2008. Retrieved 22 May 2009. ^ "Bruyneel: Armstrong, Contador will have to work together". ESPN. 2 October 2008. Archived from the original on 4 November 2008. Retrieved 27 November 2008. ^ "Contador will stay at Astana". VeloNews. 18 October 2008. Archived from the original on 7 December 2008. Retrieved 27 November 2008. ^ "Cycling and Fame, Life and Death". El Pais. 10 November 2008. Retrieved 22 May 2009. ^ "Contador opts to miss 2009 Giro". news.bbc.co.uk. 28 October 2008. Archived from the original on 17 December 2008. Retrieved 27 November 2008. ^ Brown, Gregor (22 February 2009). "Haussler wins final Algarve stage; Contador overall". Cyclingnews. Archived from the original on 24 June 2009. Retrieved 18 May 2009. ^ Haake, Bjorn (14 March 2009). "Sánchez topples Contador". Cyclingnews. Archived from the original on 24 June 2009. Retrieved 18 May 2009. He said he had a hunger knock in the finale and could not answer the attack of Sánchez. ^ Quénet, Jean-François (11 June 2009). "Stage 4 – June 10: Bourg-Les-Valence – Valence (ITT), 42.4 km". Cyclingnews. Archived from the original on 19 June 2009. Retrieved 20 June 2009. ^ Quénet, Jean-François (14 June 2009). "Stage 8 – June 14: Faverges – Grenoble, 146km". Cyclingnews. Archived from the original on 17 June 2009. Retrieved 20 June 2009. ^ Les Clarke (19 July 2009). "Contador king of Verbier". Cyclingnews. Archived from the original on 20 July 2009. Retrieved 19 July 2009. ^ "Contador moves closer to Tour win". BBC Sport. 22 July 2009. Archived from the original on 23 July 2009. Retrieved 23 July 2009. ^ Macur, Juliet (23 July 2009). "Contador Still in the Lead With Time Trial Victory". New York Times. Retrieved 23 July 2009. ^ "Contador seals 2009 Tour victory". BBC Sport. 26 July 2009. Archived from the original on 27 July 2009. Retrieved 27 July 2009. ^ "¡¡En París suena el himno danés en honor a Contador!!". Marca. 26 July 2009. Retrieved 26 July 2009. ^ "Cycling: Contador Tour win celebrated with wrong anthem". Cycling Central. 26 July 2009. Archived from the original on 30 August 2009. Retrieved 27 July 2009. ^ a b "Contador, Armstrong trade barbs after Tour". Associated Press. 15 September 2009. Archived from the original on 4 December 2010. Retrieved 29 July 2009. ^ Reuters (31 July 2009). "Contador turns down Astana offer, says agent". Retrieved 1 August 2009. ^ Andrew Hood (11 August 2009). "Paulinho follows Armstrong to RadioShack; Azevedo new DS". VeloNews. Archived from the original on 15 August 2009. Retrieved 18 August 2009. ^ AFP (15 August 2009). "Astana intends to enforce Contador's contract". VeloNews. Archived from the original on 18 August 2009. Retrieved 18 August 2009. ^ Cyclingnews (19 February 2010). "Contador takes control in Malhão". Cyclingnews. Future Publishing Limited. Archived from the original on 19 February 2010. Retrieved 20 February 2010. ^ Stephen Farrand (21 February 2010). "Contador wins the Volta ao Algarve". Cyclingnews. Future Publishing Limited. Archived from the original on 22 February 2010. Retrieved 21 February 2010. ^ James Huang (19 February 2010). "Specialized Shiv time trial design possibly banned by UCI". Cyclingnews. Future Publishing Limited. Archived from the original on 22 February 2010. Retrieved 20 February 2010. ^ "Contador claims second Paris-Nice". BBC Sport. 14 March 2010. Archived from the original on 15 March 2010. Retrieved 14 March 2010. ^ Glendenning, Barry (19 July 2010). "Tour de France 2010: Stage 15 – live!". The Guardian. UK. Archived from the original on 22 July 2010. Retrieved 19 July 2010. ^ PA Sport (19 July 2010). "Contador steals lead". Sportal Australia. PA Sport. Archived from the original on 22 July 2010. Retrieved 19 July 2010. ^ "Alberto Contador: "Today, we could not do like we did in Spa."". Velonation.com. 19 July 2010. Retrieved 30 September 2010. ^ Phil Liggett and Paul Sherwen (2010). Le Tour De France 2010. World Cycling Productions (DVD). ^ "Contador seizes Tour de France lead from Schleck". BBC Sport. 19 July 2010. Archived from the original on 22 July 2010. Retrieved 23 July 2010. ^ Mackey, Robert (19 July 2010). "Contador Apologizes on YouTube". The New York Times. ^ "Alberto Contador seals third Tour de France victory". BBC Sport. 25 July 2010. Archived from the original on 25 July 2010. Retrieved 25 July 2010. ^ "Saxo Bank-SunGard Signs Contador's Top Spaniards". Cyclingnews. 12 August 2010. Retrieved 30 September 2010. ^ "Contador wins Tour of Catalunya". Yahoo! Eurosport. TF1 Group. Reuters. 27 March 2011. Retrieved 27 March 2011. ^ "Alberto Contador wins Giro d'Italia". The Daily Telegraph. London. 29 May 2011. Retrieved 30 May 2011. ^ "Alberto Contador wins 2011 Giro d'Italia". BBC Sport. 29 May 2011. Archived from the original on 30 May 2011. Retrieved 30 May 2011. ^ "Alberto Contador will race in Tour". 12 June 2011. Retrieved 22 July 2011. ^ a b "Hushovd unhappy with delays in Contador doping hearing". velonation. 3 June 2011. ^ "Alberto Contador optimistic about the Alps". The Times of India. 16 July 2011. Archived from the original on 19 July 2012. Retrieved 24 December 2011. ^ "Calm before the storm". Cyclingnews. Future Publishing Limited. 21 June 2011. Archived from the original on 30 June 2011. Retrieved 2 July 2011. ^ "The Tour's highest-ever finish". Cyclingnews. Future Publishing Limited. 19 October 2010. Archived from the original on 30 June 2011. Retrieved 22 July 2011. ^ "Tour set for thrilling climax as Schleck strips Voeckler of yellow jersey after 19th stage". THE TIMES OF INDIA. London. 22 July 2011. Archived from the original on 24 July 2011. Retrieved 22 July 2011. ^ Dale Robertson (27 July 2011). "Hincapie, Ochowicz win in supporting roles". Houston Chronicle. Retrieved 28 July 2011. ^ "Contador returns with Saxo Bank". Cycling News. Future Publishing Limited. 8 June 2012. Retrieved 8 June 2012. ^ "2012 Eneco Tour results, stage 7". 12 August 2012. ^ "Saxo Bank-Tinkoff Bank names Alberto Contador's team for Vuelta a España". 12 August 2012. ^ "Contador: Opportunities exist every day to catch Purito". Velonews.competitor.com. Retrieved 5 September 2012. ^ Peter Cossins (3 September 2012). "Epic win for Cataldo on Cuitu Negru". Cycling News. Future Publishing Limited. Archived from the original on 3 November 2011. Retrieved 6 September 2012. ^ a b Cycling (5 September 2012). "Alberto Contador leads Vuelta a España after brilliant stage win". London: Telegraph. Retrieved 5 September 2012. ^ "Menchov prevails on the Bola del Mundo". Cycling News. Future Publishing Limited. 8 September 2012. Archived from the original on 10 September 2012. Retrieved 11 September 2012. ^ "Alberto Contador wins Vuelta a España for the second time". The Guardian UK. London: 2012 Guardian News and Media Limited. Associated press. 9 September 2012. Retrieved 11 September 2012. ^ "Contador has lacklustre Worlds time trial". Cycling News. Future Publishing Limited. 20 September 2012. Retrieved 27 September 2012. ^ Alasdair Fotheringham (22 September 2012). "Spain ready to play various cards at world championship". Cycling News. Future Publishing Limited. Retrieved 27 September 2012. ^ Daniel Benson (23 September 2012). "UCI Road World Championships 2012: Elite Men road race Results". Cycling News. Future Publishing Limited. Retrieved 16 April 2016. ^ "Contador wins revived Milano-Torino road race". SportsNet. 2001–2012 Rogers Communications. Associated Press. 26 September 2012. Archived from the original on 5 March 2016. Retrieved 27 September 2012. ^ "Alberto Contador wraps up camp, sets big goals for 2014". VeloNews. Competitor Group, Inc. 30 November 2013. Retrieved 12 April 2014. ^ "Contador rules out breaking Saxo Tinkoff contract before end of agreed term". VeloNation. VeloNation LLC. 1 December 2013. Retrieved 12 April 2014. ^ "Contador wins Algarve stage atop Alto do Malhao". Cyclingnews.com. Future plc. 22 February 2014. Retrieved 23 February 2014. ^ "Stage 4: Indicatore (Arezzo) to Cittareale (Selva Rotonda)" (PDF). Tirreno–Adriatico. RCS Sport. Retrieved 12 March 2014. ^ "Stage 5: Amatrice to Guardiagrele" (PDF). Tirreno–Adriatico. RCS Sport. Retrieved 12 March 2014. ^ "Stage 3: Banyoles to La Molina". Cyclingnews.com. Future plc. Retrieved 24 March 2014. ^ "Alberto finished second overall in Catalunya". Tinkoff–Saxo. Tinkoff Sport. 30 March 2014. Archived from the original on 2 April 2014. Retrieved 30 March 2014. ^ Cary, Tom (14 July 2014). "Alberto Contador crashes out as Vincenzo Nibali takes Stage 10 and yellow jersey". The Daily Telegraph. Retrieved 15 July 2014. ^ "Contador says adios to the Vuelta". pelotonmagazine.com. ^ "Contador to ride Vuelta, healing faster than expected". pelotonmagazine.com. ^ Andrew Hood (September 2014). "Alberto Contador drives stake into Vuelta a España". VeloNews. Competitor Group, Inc. Retrieved 8 September 2014. ^ Peter Cossins (13 September 2014). "Vuelta a España: Contador wins on Ancares". Cyclingnews.com. Future plc. Retrieved 13 September 2014. ^ "Contador seals overall 2014 Vuelta a España victory". Cyclingnews.com. Future plc. 14 September 2014. Retrieved 14 September 2014. ^ Andrew Hood (11 September 2014). "Contador defends decision to skip Spanish worlds". VeloNews. Competitor Group, Inc. Retrieved 11 September 2014. ^ "Alberto Contador: "I withdraw from Beijing to focus on 2015". Tinkoff-Saxo. 2014 Tinkoff Sport A/S. 6 October 2014. Archived from the original on 8 October 2014. Retrieved 6 October 2014. ^ Andrew Hood (14 February 2015). "Alberto Contador confirms Giro-Tour double … again". VeloNews. Competitor Group, Inc. Retrieved 30 April 2015. ^ Alasdair Fotheringham (30 April 2015). "Contador moves into Vuelta a Andalucia race lead". Cyclingnews.com. Future plc. Retrieved 30 April 2015. ^ Richard Windsor (20 February 2015). "Contador wins Ruta del Sol stage three and extends overall lead". Cycling Weekly. IPC Media Sports & Leisure network. Retrieved 20 February 2015. ^ "Froome seizes overall lead at Vuelta a Andalucia". Cyclingnews.com. Future plc. 21 February 2015. Retrieved 30 April 2015. ^ Daniel Benson (18 March 2015). "Tirreno-Adriatico: Sagan wins stage 6". Cyclingnews.com. Future plc. Retrieved 30 April 2015. ^ Alasdair Fotheringham (28 March 2015). "Contador crashes hard at Volta a Catalunya". Cyclingnews.com. Future plc. Retrieved 30 April 2015. ^ Alasdair Fotheringham (30 April 2015). "Alberto Contador exclusive: Recovered from injury and ready for the Giro d'Italia". Cyclingnews.com. Future plc. Retrieved 30 April 2015. ^ "Contador ahead of Giro d'Italia rivals in opening TTT skirmish – Cyclingnews.com". ^ "Contador confirmed to start Giro d'Italia stage 7 – Cyclingnews.com". ^ "Alberto Contador back in Giro d'Italia lead after crucial time trial – Cycling Weekly". 23 May 2015. ^ "Alberto Contador reclaims Giro lead from Fabio Aru after time trial". ^ Emil Axelgaard (26 May 2015). "Amazing Landa makes it two in a row in the queen stage". Cycling Quotes. CyclingQuotes.com 2013. Retrieved 27 May 2015. ^ "Results-Giro d'Italia". Eurosport. Discovery Communications. Retrieved 30 June 2015. ^ Gregor Brown (31 May 2015). "This is my third Giro d'Italia win, insists Alberto Contador". Cycling Weekly. IPC Media Sports & Leisure network. Retrieved 1 June 2015. ^ "Alberto Contador seals Giro d'Italia after Iljo Keisse holds on for final stage victory in Milan". Daily Telegraph. 31 May 2015. Retrieved 4 June 2015. ^ "Route du Sud win changes nothing, says Contador". Cyclingnews.com. Future plc. 22 June 2015. Retrieved 22 June 2015. ^ "Classifications". ASO. Archived from the original on 9 August 2015. Retrieved 9 August 2015. ^ Pretot, Julien (26 July 2015). "Contador double bid fizzles out after Giro exertions". Reuters. Retrieved 7 March 2016. ^ "Kreuziger replaces sick Contador as captain in Clásica San Sebastián". cyclingnews.com. 30 July 2015. Retrieved 7 March 2016. ^ Clarke, Stuart (10 March 2015). "Alberto Contador confirms retirement date". Cycling Weekly. Retrieved 7 March 2016. ^ "Thomas seals consecutive overall Volta a Algarve victories". cyclingnews.com. 22 February 2016. Retrieved 7 March 2016. ^ Clarke, Stuart (13 March 2016). "Geraint Thomas stages remarkable comeback to hold off Alberto Contador and win Paris-Nice". Cycling Weekly. Retrieved 14 April 2016. ^ "Volta a Catalunya: Quintana cruises as Tsatevich claims the finale". sbs.com.au. 28 March 2016. Retrieved 14 April 2016. ^ Martin, Richard (8 April 2016). Ferris, Ken, ed. "Contador to carry on competing in wake of Basque triumph". reuters.com. Retrieved 14 April 2016. ^ "Alberto Contador withdraws from the Tour de France". theguardian.com. 11 July 2016. Retrieved 15 September 2016. ^ "Contador wins Vuelta a Burgos title by one second". cyclingnews.com. 6 August 2016. Retrieved 6 August 2016. ^ a b "Alberto Contador will switch to race for Trek-Segafredo in 2017". theguardian.com. 15 September 2016. Retrieved 15 September 2016. ^ "Contador signs with Trek Segafredo on Tour de France rest day – Cyclingnews.com". ^ "Team Sky's Sergio Henao wins Paris-Nice by two seconds". BBC Sport. BBC. 12 March 2017. Retrieved 12 March 2017. ^ Andrew Hood (26 July 2006). "Astana 5' cleared by Spanish courts". VeloNews. ^ Drap, Rob (8 July 2007). "Now the man they hoped would save the Tour faces a new inquiry into doping allegations". Daily Mail. UK. Retrieved 30 May 2008. ^ Gutiérrez, Juan (27 July 2007). "El Tour califica a Contador de líder "limpio" y "creíble"" (in Spanish). As.com. Retrieved 30 May 2008. ^ Johnson, Greg (6 December 2006). "First witnesses testify in Operación Puerto". Cyclingnews. Retrieved 30 May 2008. ^ "An Interview with Alberto Contador, July 29, 2007". Cyclingnews. 29 July 2007. Retrieved 30 May 2008. ^ Mandard, Stéphane (28 July 2007). "Alberto Contador, maillot jaune miraculé de l'"opération Puerto"". Le Monde (in French). France. Retrieved 30 May 2008. ^ Hood, Andrew (26 July 2007). "On the list, off the list – Alberto Contador and Operación Puerto". VeloNews. Archived from the original on 21 March 2008. Retrieved 30 May 2008. ^ Agence France Presse (31 July 2007). "German drugs expert points finger at Contador". Sydney Morning Herald. Archived from the original on 17 August 2007. Retrieved 31 July 2007. ^ "Das größte Ding aller Zeiten (The greatest thing of all times)" (in German). ZDF. 30 July 2007. Archived from the original on 4 August 2007. Retrieved 30 July 2007. ^ a b "Expert claims Contador doped". iol.co.za. 1 August 2007. Archived from the original on 17 August 2007. Retrieved 1 August 2007. ^ "Contador: 'I have never doped'". VeloNews. 10 August 2007. Archived from the original on 28 August 2007. Retrieved 10 August 2007. ^ "Video – Breaking News Videos from". CNN. Retrieved 30 September 2010. ^ Weislo, Laura (30 September 2010). "Contador's Contaminated Food: Excuse Or Possibility?". Cyclingnews. Retrieved 30 September 2010. ^ "BBC Sport – Cycling – Angry cyclist Alberto Contador pleads innocence". BBC News. 30 September 2010. Archived from the original on 1 October 2010. Retrieved 30 September 2010. ^ "Tour de France winner rejects positive doping test – This Just In – CNN.com Blogs". News.blogs.cnn.com. 30 September 2010. Retrieved 30 September 2010. ^ "Contador blames contaminated meat – Yahoo! Eurosport". Uk.eurosport.yahoo.com. Archived from the original on 2 October 2010. Retrieved 30 September 2010. ^ "Blazin' Saddles – Yahoo! Eurosport". Uk.eurosport.yahoo.com. Archived from the original on 5 October 2010. Retrieved 30 September 2010. ^ "Video – Breaking News Videos from". CNN. Archived from the original on 30 September 2010. Retrieved 30 September 2010. ^ "Cyclist Alberto Contador blames food contamination for failed steroid test – amFIX – CNN.com Blogs". Amfix.blogs.cnn.com. 30 September 2010. Retrieved 30 September 2010. ^ "Alberto Contador submits final defence to overturn proposed doping ban". The Guardian. UK. 8 February 2011. Retrieved 24 July 2011. ^ Macur, Juliet (4 October 2010). "2nd Failed Test Puts Heat on Contador". New York Times. Retrieved 19 February 2011. ^ "Experts mixed on Alberto Contador's tainted beef defense for positive Clenbuterol test during Tour". Daily News. New York. 1 October 2010. Retrieved 24 July 2011. ^ "Contador suspended after positive test – Yahoo! Eurosport". Eurosport. Archived from the original on 2 October 2010. Retrieved 30 September 2010. ^ "Alberto Contador Tests Positive For Clenbuterol". Cyclingnews. 30 September 2010. Archived from the original on 2 October 2010. Retrieved 30 September 2010. ^ Greg Johnson (30 September 2010). "Alberto Contador Suspended Over Traces of Clenbuterol From Tour De France Test". Cyclingnews. Archived from the original on 3 October 2010. Retrieved 30 September 2010. ^ "BBC News – Tour de France winner Alberto Contador tests positive". BBC. 30 September 2010. Archived from the original on 30 September 2010. Retrieved 30 September 2010. ^ Weislo, Laura (30 September 2010). "Contador's scientific expert De Boer details defense". Cyclingnews. ^ "UCI appeals Contador decision to Court of Arbitration for Sport". Cyclingnews. 24 March 2011. ^ "Alberto Contador's doping case delayed until November". The Guardian. London. 26 July 2011. Retrieved 27 July 2011. ^ "Riis continues to support Contador despite ban". Cycling News. Future Publishing Limited. 7 February 2012. Retrieved 7 February 2012. Wikimedia Commons has media related to Alberto Contador.